Electricity powers our lives. It provides the energy for most powered items in Canadian homes, from lights to washing machines to heating systems. It’s hard to imagine your home without electricity, yet it poses a great threat to its users through electrocution or electrical fires that may cause injury, death, and loss of property. Fires start in an instant and can consume your entire home in a matter of minutes because almost any material inside the house can be used as fuel: furniture, draperies, clothing, books, and so on. A fire can grow very quickly, and it’s usually not the flames that kill, but the smoke. It’s critical not to overestimate your ability to extinguish it or underestimate the amount of time needed to escape. 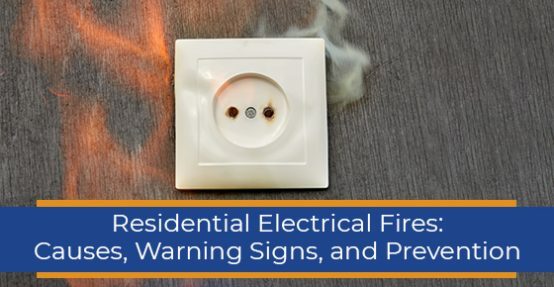 To keep your family and possessions safe, you need to understand the causes and warning signs of electrical fires, as well as how to prevent them. Electrical fires account for about 6% of all cases of residential fires. Electrical fires in your home may initiate from the wiring, electrical distribution, transformers, cordplugs, meter boxes, outlets, power switching gear, surge protectors, lighting fixtures, electric fences, and electrical arcing as the source of heat. These electrical fires can be hard to detect because the wiring is hidden in the wall. For instance, electrical wires that start in a wall can smoulder for a while, with the smoke hidden, which can delay detection. By the time someone notices the smoke, the fire may have spread considerably behind and within the walls. The electrical demands in modern homes have increased dramatically over the last four decades, and can easily overburden an existing electrical system that has not been upgraded to meet the demand. This is a particular concern for older homes whose wiring was done about 40 years ago. Moreover, older homes are unlikely to comply with the modern electric code and safety requirements, which further increases the risk of hazardous conditions that could lead to an electrical fire. Over time, any home can be at risk of an electrical fire as connections loosen, wire insulation ages, oil and dirt cause overheating of electrical components, and switches and receptacles wear out or come loose. The ability of electrical fires to spread undetected increases the risk of injury and loss due to damage. Moreover, electrical fires are difficult to put out, and can increase the risk of electrocution unless the power can be properly disconnected. Inspect and repair lighting and electrical component (switches, outlets, etc.) problems. Inspect a new home and make the necessary repairs before moving in. Ensure any electrical modifications meet safety standards and codes. Upgrade wiring in homes built before 1973, especially those with aluminum wiring. Replace fuses and circuit breakers with those of appropriate size. Prevent combustible materials from touching bulbs or lampshades. Position lamps away from open windows or areas of strong breezes that cause draperies to get blown onto hot light bulbs. Don’t run cords under combustible materials, including carpets and bedding, or across doorways and other frequently travelled areas. Don’t overload outlets or replace them with extensions. Both of these generate excess heat that could lead to a fire. If you need more outlets, ask an electrician. Keep electrical appliances away from wet counters or floors, especially those in the kitchen and bathroom. Don’t let children play with or around electrical appliances, like hair dryers, extensions, irons, or space heaters. Keep all combustible materials at least three feet from all heaters. Replace any electrical tools that show signs of wear, like cracked or frayed cords, small electrical shocks, or overheating. Need a licensed electrician in Toronto? Home is the place where you expect to feel safe. But underestimating the danger of residential fires and overestimating your ability to protect your family and property can put everyone and everything you care about at great risk. Hiring a licensed electrician in Toronto to install or maintain electronic equipment in your home. Contact Hi-Lite Electric today for an electrician you can trust.